It's all about the grass. That juicy, aromatic, medium-rare ribeye steak you might enjoy from us was built on a hundred thousand bites of great grass. Fat is needed for this memorable eating experience, and fat is created when cattle eat enough nutritious forage to keep them growing. 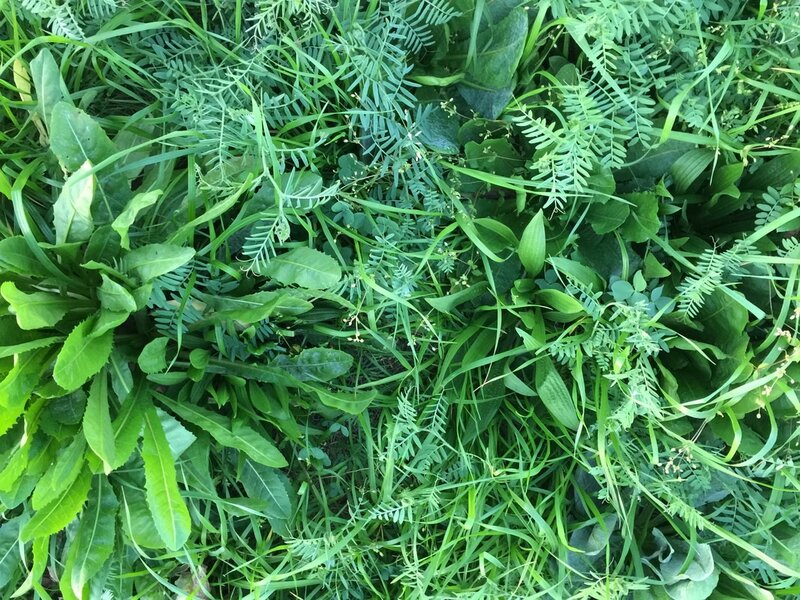 Here at Deep Grass Graziers, our growing cattle might graze swards of Chicory, Turnips, Vetch, Triticale, Ryegrass, Oats, and Clovers in the Winter and Spring. In the Summer and Fall, young bulls and heifers have Alfalfa, Pearl Millet, Tift-85 Bermudagrass, Sunn Hemp, Cowpea, and Crabgrass. Even though single species plantings (monocultures) are easier to manage and might produce more forage per acre, we are passionate about soil health. We plant multiple species of forages (polycultures) at the same time to try and mimic nature. By doing this, we believe we can build healthy soil life which will foster more resiliency and grow more forage on less fertilizer. Blending grasses, legumes, brassicas, and forbs, our long term goal is to produce all our forage growth without any off farm fertilizers. We have work to do before achieving that goal. ​We manage our finishing pastures under irrigation to ensure we have enough grazing despite the weather, and often practice what Andre Voisin calls 'Rational Grazing'. This involves moving cattle to lush pastures, leaving enough forage behind to promote quick re-growth. 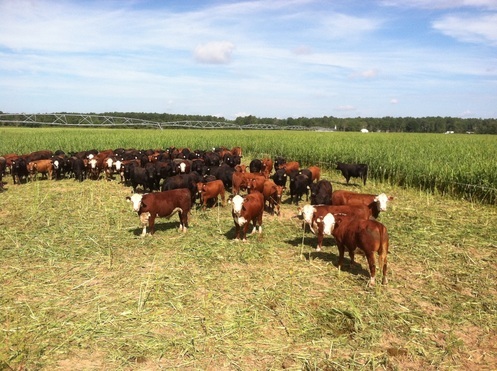 If practiced properly, one can maximize forage production without sacrificing animal performance. It is both Art and Science, and not easily mastered...although we're getting a little better at it every season. Another key to soil health is minimizing tillage. Tilling the soil creates a uniform seed bed, reduces weed pressure, and provides a shot of growth to the new seedlings, but does so at the expense of soil organic matter. That 'dirt smell' you get when walking through a freshly plowed field is actually soil microbes burning up. Those microbes are necessary for the many complex interactions that take place underground to produce healthy growth above ground. On our farm, we try and minimize soil disturbance, and do so only when completely necessary. We follow the 4 basic principles of soil health in order to regenerate the health of our soils, our plants, our animals, and our selves.